Tec-view is a family of products to meet all your electronic window advertising needs. We help you choose the most productive solution for your business, then we design, install and maintain your system and help you use it to best effect. Electronic Displays in windows is part of what we do. But its much more subtle than that - we aim to engage your customers with an intimate, interactive experience which satisfies customers demand for immediate information 24x7. If you have more than one branch, we can link our systems together to display properties of common interest to both branches. If you want your own display in a conveniene or other store, we can arrange that too. Whatever your special needs, we can provide a tailored solution and take out all the worry and hassle of making it happen. provides basic image sequencing on one or more TFT display screens in your window. allows your customers to browse available properties by Price range and Rent/Buy and to view detailed information on any property - 24x7. delivers a printout to potential customers on demand through your letterbox, 24 x 7. Tec-Print works in conjunction with Tec-View Interactive. allows you to have a second or third virtual shop-front wherever you can obtain display space economically. You can manage everything remotely over a secure connection over existing Internet connections. enhances your office security by constantly monitoring your shop-front and recording the images to a secure, of-site web-site. Whichever solution or combination of solutions is right for your business, Tecbridge Professional provides all the equipment, the software installation training and maintenance. All you need to do is load the images and captions. 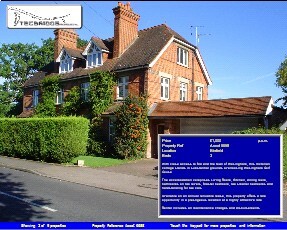 At the heart of every Tec-View system is Tec-View Software, which controls the sequence of images displayed to the public, provides the interaction which lets the public get the information they want quickly and provides you, the Estate Agent with the tools to quickly enter and edit property particulars. You can run as many screens as you want from the same database - yet display different content on each screen. for example, you may want to reserve a screen for property rentals and another for sales. You can even run remote screens in someone else's window space with Tec-Remote - again running from the same database. 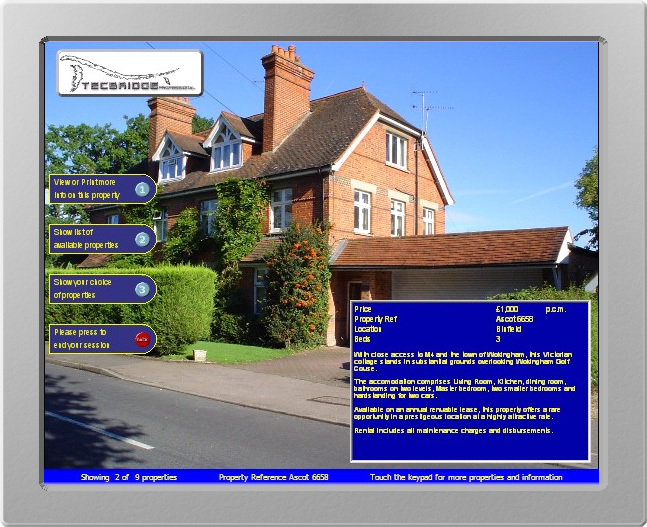 Tecbridge delivers its solutions to Independent Estate Agents as a Subscription Service. There is no capital outlay - you simply pay a regular monthly subscription. Read more.